This Oval design specifically to conform to body dynamics standard. With two color unsurpassed environmental PTR & PP material and attention to detail. 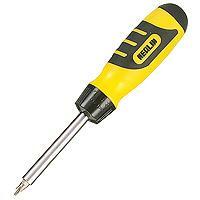 Ratchet mechanism is all metal for durability and easy installatioin of bits and accessories. Heavy duty alloy steel and reinforced plastic combinative construction. Unique 13 - IN -1 bits magazine devise, turn off the rear cover to change a desire bit.